Applications: 40-75 Hp / Gearcase: 3-1/2"
Incorporating the newest and efficient design features based from high-performance stainless steel propellers, Hustler aluminum boat propellers run away from competition. Hustler High Performance series propellers are the only aluminum propeller manufactured with performance enhancing vent holes. 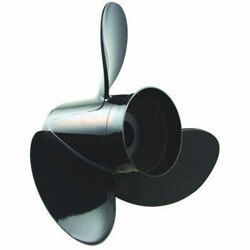 There's a Hustler propeller perfect for almost any boating application. Achieve maximum top end speed with Turning Point's High-Performance blade geometry. Our blade designs incorporate industry leading high rake patterns, fine tuned pitch progression, aggressive cupping, and sharp trailing edges. Increase horsepower, acceleration, and top end speed with our maximum exhaust flow hub kit systems. Higher RPM hole shots reduces planning times over OEM and other aftermarket propellers. Turning Point's High Performance stainless & aluminum propellers are also vented to further increase performance. The perfect RPM can be found with Turning Point's wide range of high performance pitch options. Take time to accurately tune in the optimal pitch & RPM for any application with the Prop Wizard. Fuel efficient blade designs allow for maximum performance while maintaining low fuel consumption. Turning Point's efficient-slip technology allows for faster cruising speeds at lower RPM - Saves fuel, saves money! Squeeze Cast for Added Strength The process generates the highest mechanical properties attainable in a cast product, resulting in tighter grain structures. 9.9 hp to 300+ hp aluminum propellers use Turning Point’s Hub Kit System, unlike competition that don’t offer it in the smaller gearcases.